Each day, I grow and learn. Some days, I grow more than others. Often, what I learn is not applicable at the moment, but I add it to my palette for the future. 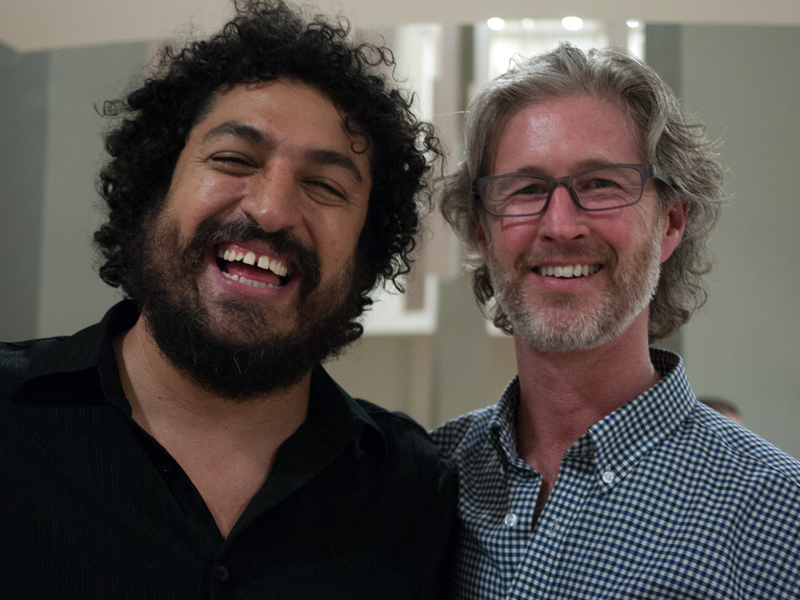 Recently, I had the honor of accompanying my favorite creative duo, Jane Gittings and François Robert, to a compelling art exhibition titled, “A World Separated by Borders” at The Museo De Arte De Sonora (MUSAS) in Hermosillo, Mexico. François was one of an esteemed group of artists who showed in this exhibition, including Michael Hyatt, Debbi McCullough, Petra Boehm (curator) and Alejandra Platt. I have always struggled to articulate the reality that I see around me. My goal is not to complain, but to get people to think and act. Unfortunately, words are woefully inadequate to express and define the complex issues that I believe that we face today. There are too many variables, attributes or nuances to explain. That is where art comes into play. 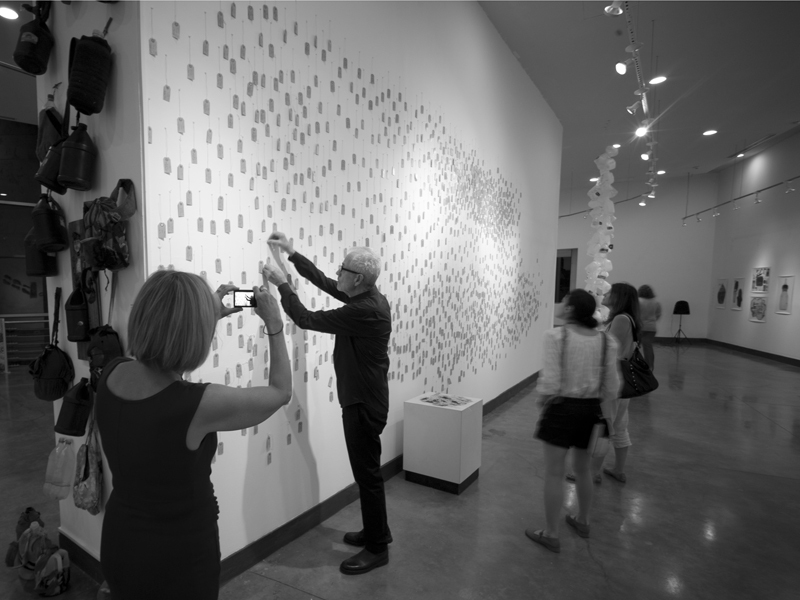 “A picture paints a thousand words.” And a room full of art and people creates a dialogue that resonates far beyond the walls where the art hangs. The exhibition, “A World Separated by Borders” was no exception. 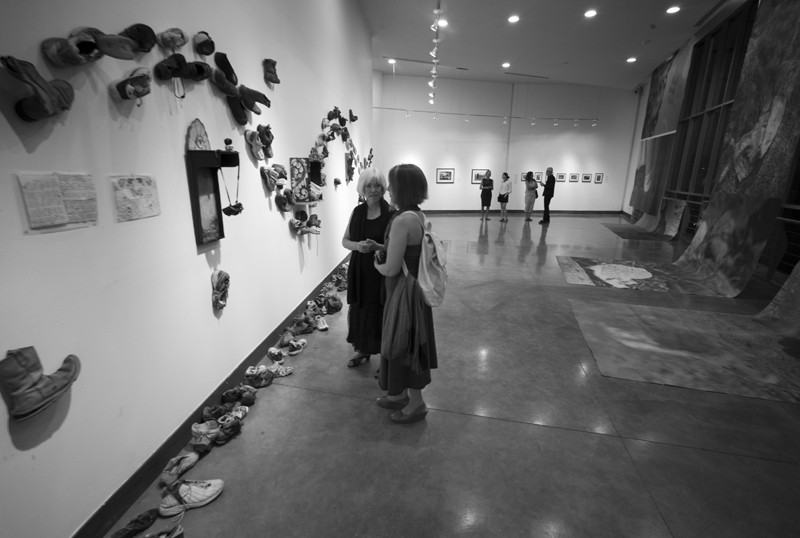 I am sure different people took away their own unique perspectives, but I would bet that each continued the conversations they started at the exhibition. Let me back up and give some context. My wife, Lyra, and I were actually invited to accompany a humanitarian group, The Samaritans of Tucson, to caravan from Tucson, Arizona to Hermosillo, Mexico. 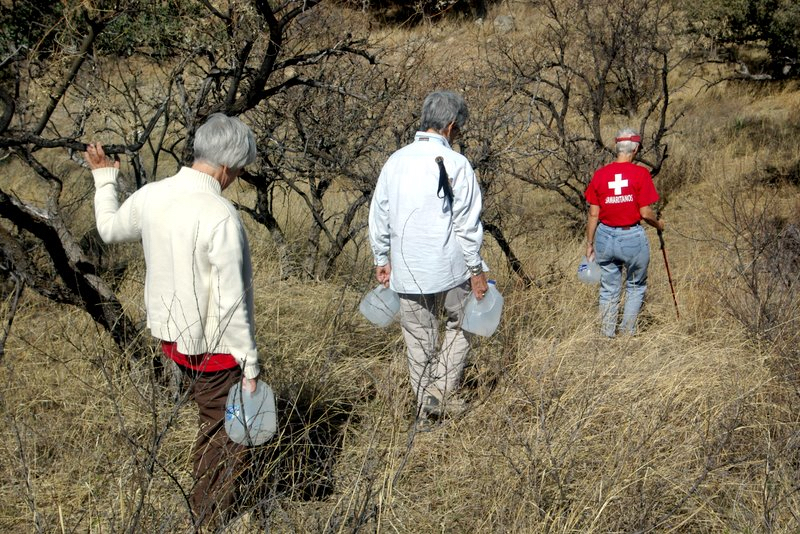 We were the guests of Jane and François who are members of this group whose mission it is to drop water and food for people crossing the brutal 60 mile stretch of the Sonoran desert between Mexico and Tucson. Most people cannot carry enough water to make the trek, especially in the summer heat, which can reach temperatures of 120º F...and without water, people will perish. The Samaritans’ goal is to throw a literal life line to people dying in the desert. These are people, not unlike you and me, who are at fringes of our world, separated only by the borders we erect that are both physical and figurative. The Samaritans believe that no one deserves to die alone in the desert just because they’re trying to feed their family. The Samaritans only drop jugs of water and food it is my understanding that they call Border Control and give them GPS coordinates whenever they encounter person in distress. Through my conversations, I also learned that not everyone agrees with The Samaritans. Other groups or individuals, who also patrol the area, may find the water jugs and knife them or shoot them so that the water drains out. This is a virtual death sentence…I think the punishment does not fit the crime in this case. 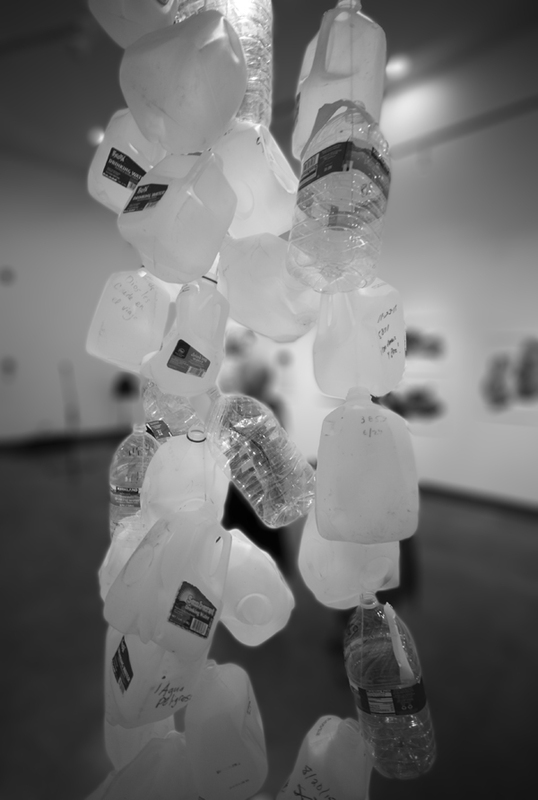 One of the exhibits by Debbi McCullough happens to be a sculpture of water jugs that The Samaritans had left behind, but were “knifed”. In another interesting conversation, I discovered that The Samaritans often find empty black water jugs strewn about in the desert. 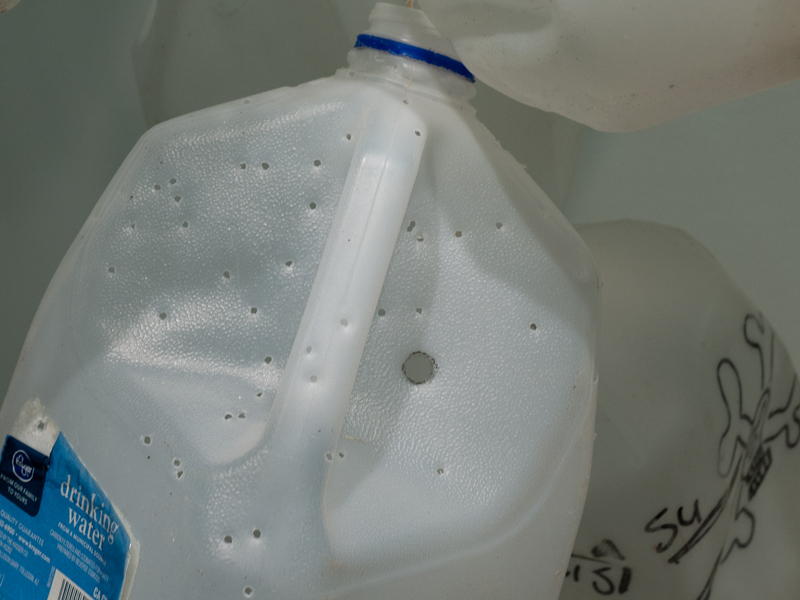 Apparently, people paint their water jugs black to avoid being seen by the border patrol. Otherwise, the jugs light up brightly when a spotlight shines on them. It seems that bleach bottles are the jug of choice to paint black. Even more compelling, are the personal belongings that people leave behind in the desert, upon which the artists of “A World Separated by Borders” are shedding light. 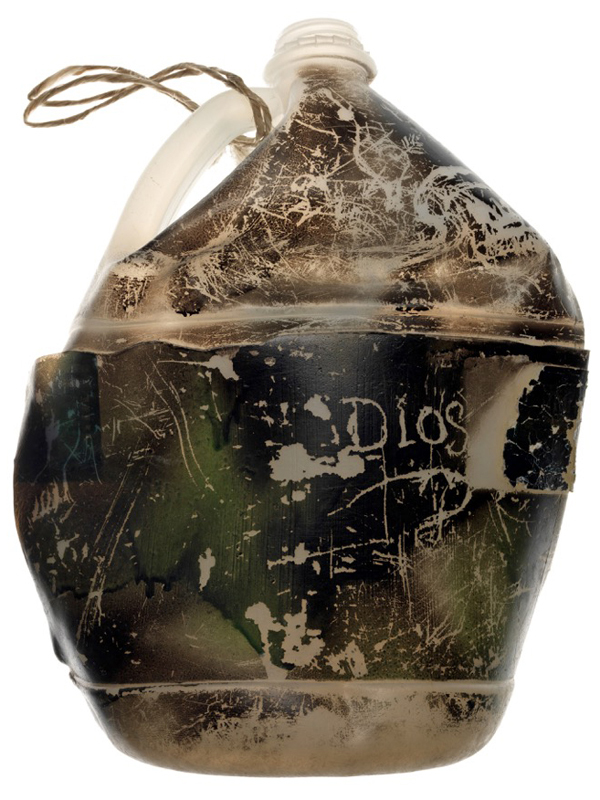 Juxtaposed against one another, these artifacts allow us to see the border “crossers” as human beings and begin to understand their terrible plight. François, with his incredible style and empathy for others, documents the subtle humanity found in these discarded artifacts. 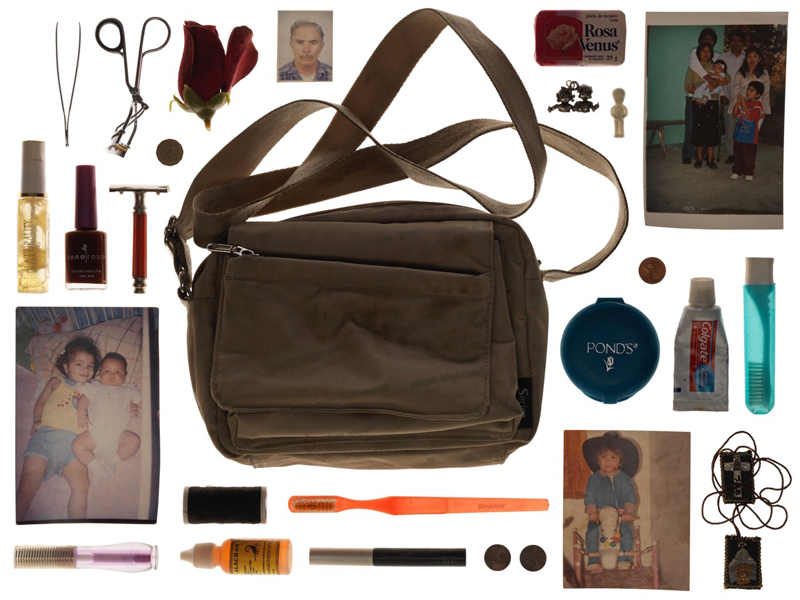 From family photos to love letters to lipstick and toothbrushes…each chronicles a story and humanizes this tragedy. The stories are similar to our own and allow us to realize that these are people like us. Actually, they are us. We need to have a meaningful dialogue about borders. Maybe it depends on which side you are on, but has a wall ever worked as a long-term or sustainable solution? For example, how did it turn out for the Chinese against the Mongolians with The Great Wall of China? Or for the Romans against the Scots and Picts with Hadrian’s Wall? Or the Communist East Germans and The Berlin Wall? Yet, today, in addition to the Mexican Border Wall, we still have The DMZ in Korea, The Moroccan Wall in the Western Sahara and The West Bank Barrier in Israel, etc. Please see Wikipedia’s comprehensive Wall List. Whatever the answer is to these terrible situations, only art can illuminate such complex issues with empathy. And through empathy can we begin to break down the walls that divide us. † All rights reserved of Francois ROBERT photographs. No part of this publication may be reproduced, stored in a retrieval system or transmitted in any form by any means electronic, mechanical, photocopying, or otherwise without written permission of the copyright owner. Unless noted, all other photos by Douglas Wills and Lyra Jakabhazy. 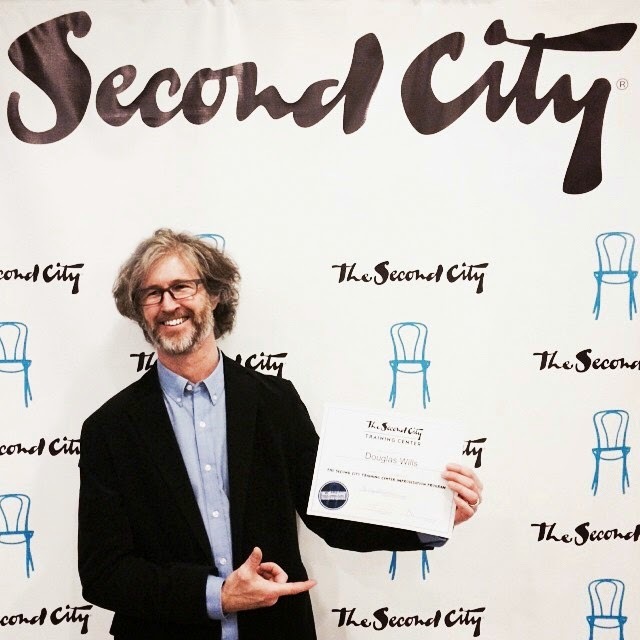 For the past year, Lyra and I have been happily struggling through improv classes at the renowned Second City Improv Training Center in Chicago. It has been great fun. The camaraderie within my ensemble is priceless. The first thing we were taught was to say “Yes, and…” to everything your scene partner proposes and figure it out afterward. You treat everything your scene partner says or does as a gift that you build upon. Then other members of your ensemble can jump in and create a new scene, building on the Fiji idea, where maybe the couple is on the beach and a pirate named Jack Sparrow crashes the party! ...and things start to get crazy! …you can fill in the blanks. The objective is that everyone in the ensemble builds on the gifts that each member brings to a scene. If you respond to your scene partner by saying, “Yea, but…” or “No, we can’t afford to travel…” nothing is added to the scene and often, it throws your novice scene partner into a panic…it might be funny to watch a novice improviser panic on stage, but it usually makes the audience to feel uncomfortable. Check out the Liam Neeson improv sketch with Ricky Gervais on how NOT to do improvisational comedy! 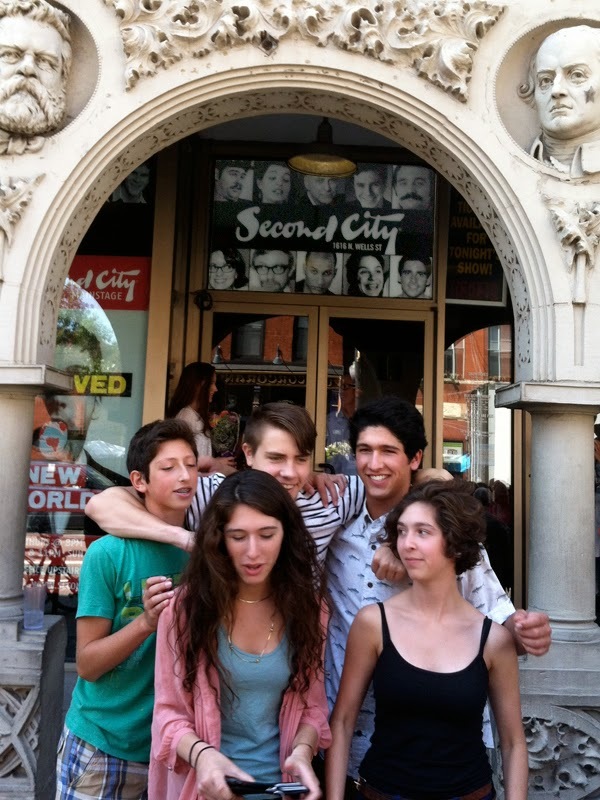 Second City proclaims that the foundation of improv is the ensemble. The ensemble is there to back up the scene’s partners. 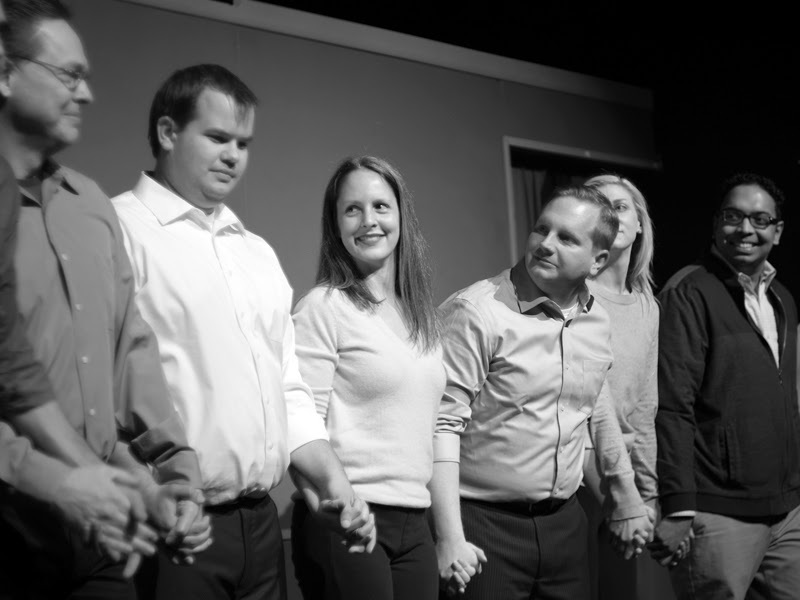 When the scene is ready to be refreshed, or has run its course, or is slowing, the ensemble is there to relieve the current improvisers and keep the energy flowing. Most importantly, all the members in the ensemble are there to build on whatever is created by saying, “Yes, and…” to each other. The sense that they actually have your back is comforting and encourages all ensemble members to take greater risks when initiating scenes. It is widely known that creativity thrives best within boundaries. 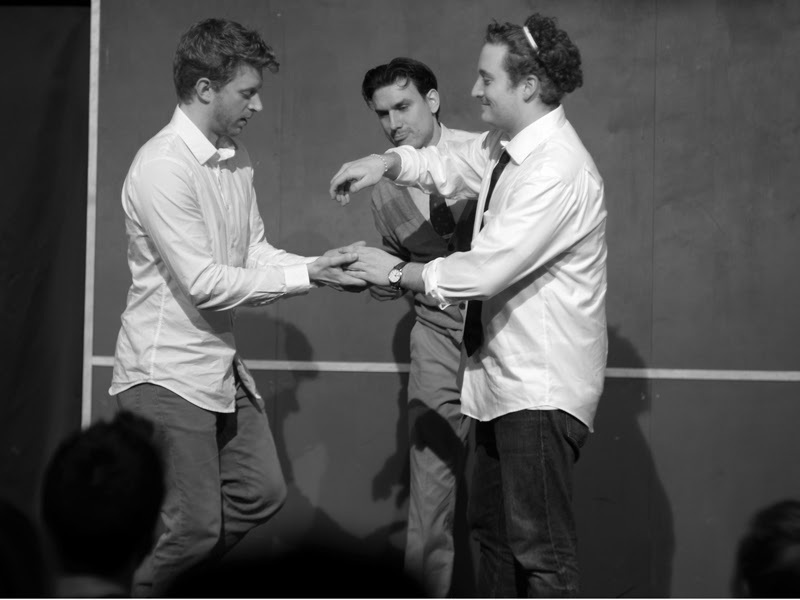 In improv, the boundaries are set by a “Get” from the audience. 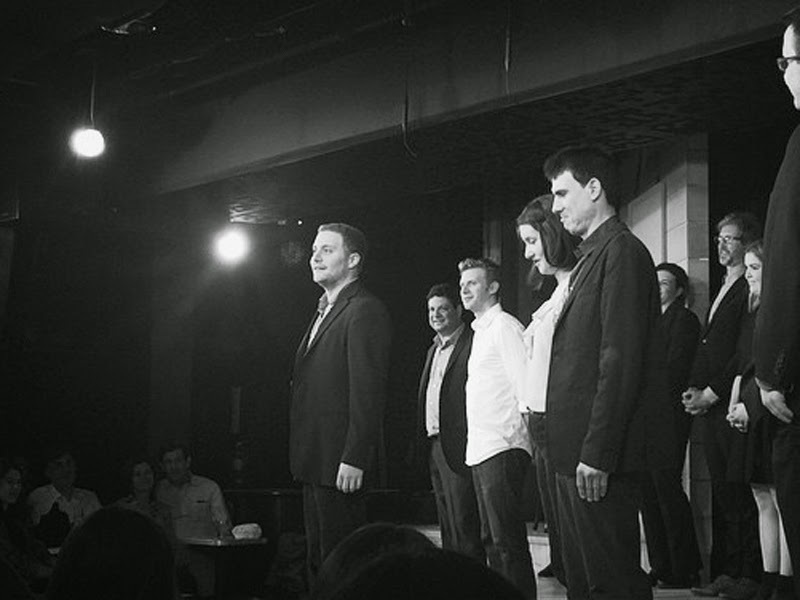 The “Get” given by the audience could be a “place that people often gather” such as a wedding or “a period in time” such as the Victorian Age or “clique in high school” such as the Mean Girls or “a never before seen musical” such as Buffy the Vampire Slayer Opera…the imaginary back story behind the scene. And always remember, creativity also thrives on permission…that is, permission to push THE boundaries set by the audience. Ultimately, by saying “Yes, and…”, you are giving your scene partner(s), and yourself, permission to create something new and playful that pushes the boundaries of normalcy. Finally, as novices, we are told, “don’t try to be funny!” If you try to be funny, it usually means that you are thinking ahead and are not FULLY PRESENT in the NOW. You should be FOCUSING on and reacting to your partner…not premeditating what you are going to say or do. Trying to be funny in improv does not work well because it often comes off as rehearsed or cliché. Of course, improv should be funny or people would stop coming to the shows! But humor flows better when it is organic, arising from the human relationships that the improvisers recreate on stage. So, will I ever make it to the “Main Stage” at The Second City? I highly doubt it...there is way too much competition to be the next Bill Murray or Tina Fey...But I can easily apply the lessons I learned from improvising to many aspects of my personal and professional life. Now, more than ever, I actively look for friendships as well as professional engagements that say: “Yes and…” to me, build on my contributions and give me the permission to innovate. I am especially thankful to Lyra, my ensemble members Brian, Hanna, Josip, Kelly, Kimber, Mac, Randy, Richard, Stass, The Second City teachers Tim Sozsko, Janna Sobel, Mark Czoske, Jay Steigmann, Jay Sukow and Ryan Bernier who all have been “Yes, And”-ing me the past year. I am always inspired by the humanity I find in people...especially, their selflessness for others who are in great need. This archetypal role model was ingrained in me by my parents at an early age. My mother and father were always helping others and giving of themselves...either through their nursing service...United Nursing Inc, organizing charity, cultural or church events...or bringing home a stray person for dinner who needed a helping hand. I was taught to admire charity in others and have always seen it as a strength, not a weakness. Professionally, I have tried to emulate this by taking on positions that somehow help others. Either by empowering the people or teams I am working with or somehow satisfying the needs of the customers they serve. If I ever stray from this, I inevitably run into a dissonance, which affects the passion I have for my work. At this point, stories are what I have to offer...stories that I hope can inspire others to act. 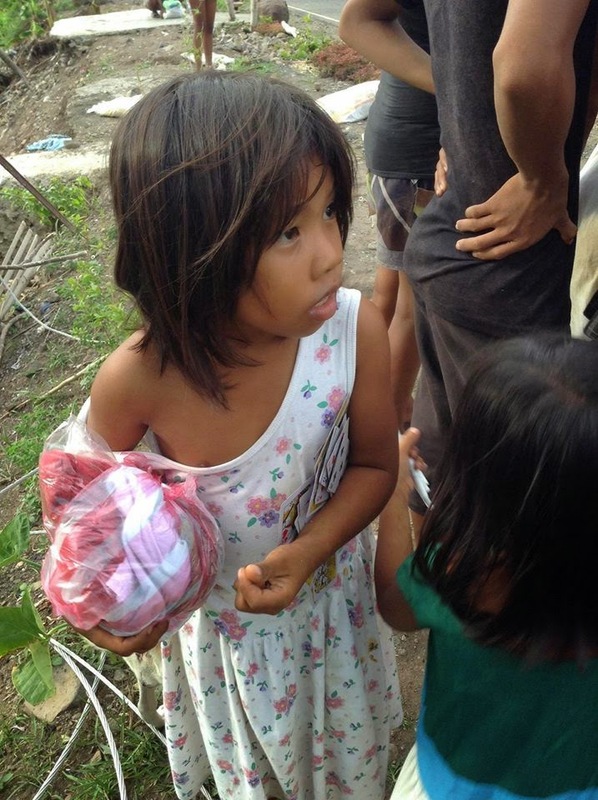 The recent typhoon Hagupit in the Philippines reminded me of a friend of mine whose acts of selflessness and community giving must be shared. I believe her story can shed light on how we might approach natural disasters in the years to come...please share this post where appropriate. So, let me tell you about a remarkable woman...someone with limited resources, no NGO support, no experience or connections with the philanthropic world. None the less, she made a difference...a big difference in the lives of many people in need. I hope her story will be a valuable contribution to a broader discussion on how the world prepares for the future natural disasters. Meet Sharon Fe Pfleider, pictured above in the opening photo of this blog post. Sharon lives in Makati City, a thriving business and residential sector in Manila, Philippines. 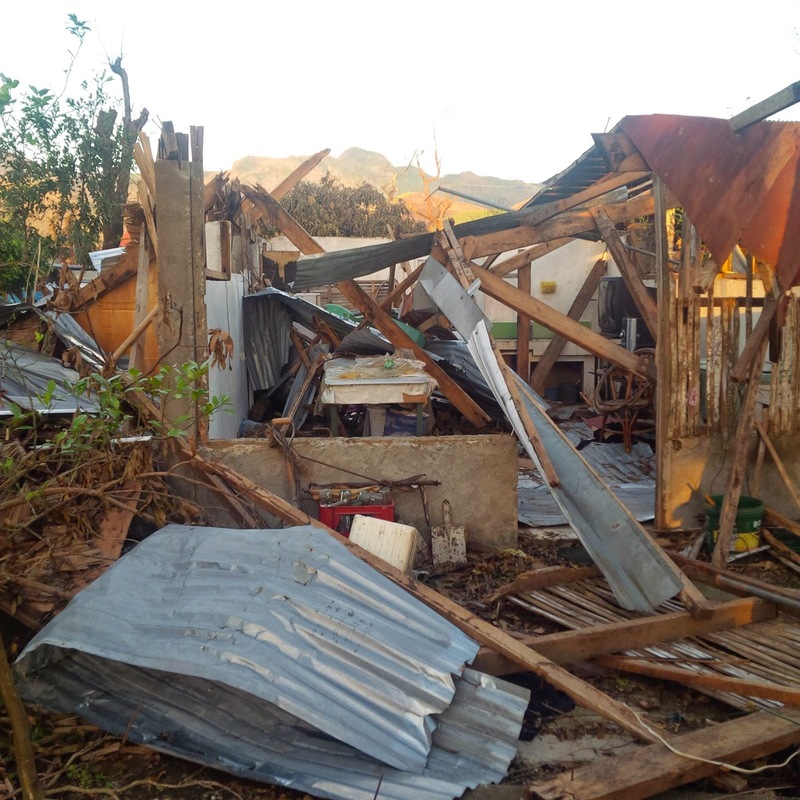 Tragically, in November 2013, Sharon’s home village of Leyte was struck by the devastating forces of Typhoon Yolanda...where many of her family members still lived. Leyte is a small village on the Eastern Visayan island of Leyte of the same name. 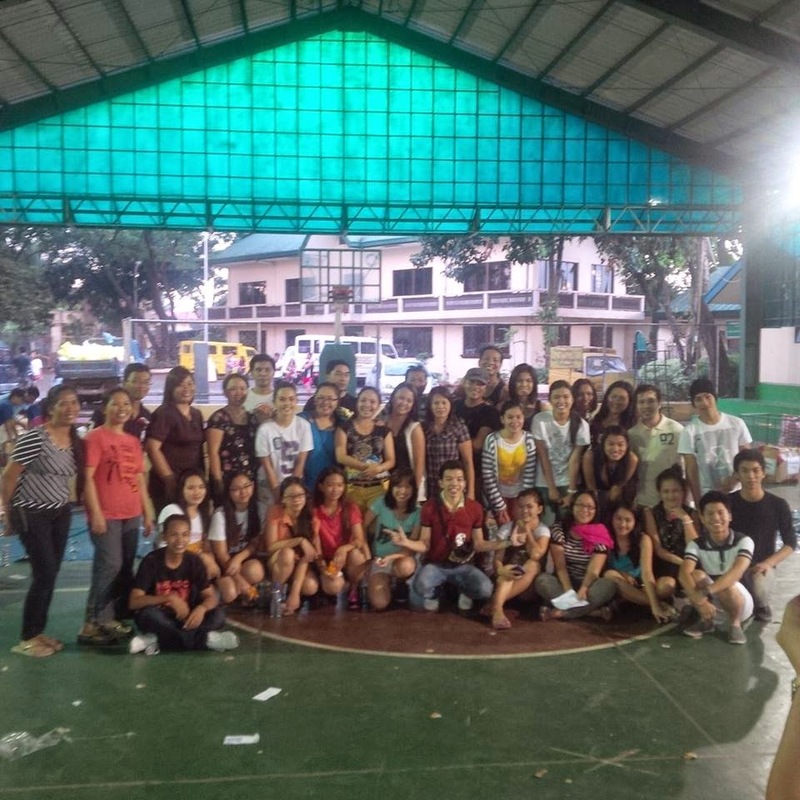 Leyte was a beautiful village full of beautiful people. Everyone there loves and takes pride in their children, just as we all do. Above, is the Leyte Elementary School to share what I hope is a glimpse of how beautiful and idyllic Leyte was. I hope for people to see that Leyte and, by extension, the Philippines, is filled with loving intelligent people just like you and me. Nothing more and nothing less. Above, a Leyte street on a typically gorgeous day...the kids are on their way home after school. 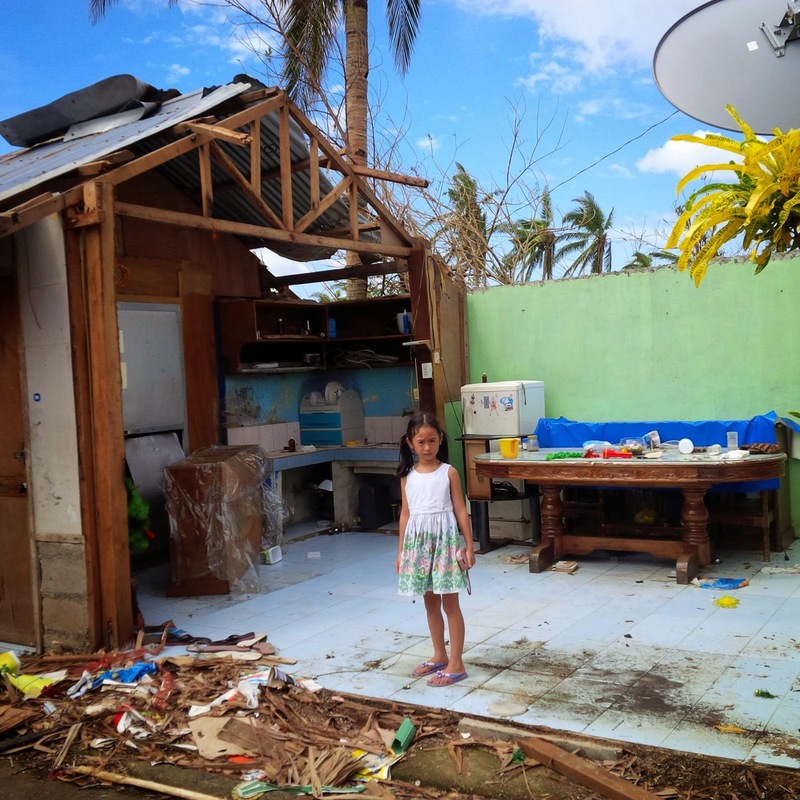 On November 7, 2013, Yolanda dropped a massive hammer on the beautiful life in Leyte...along with many others on the Eastern Visayan island of Leyte...over 10,000 people were killed...forever scarring the surviving children of this beautifully dangerously land. Above, the community Church of Leyte. 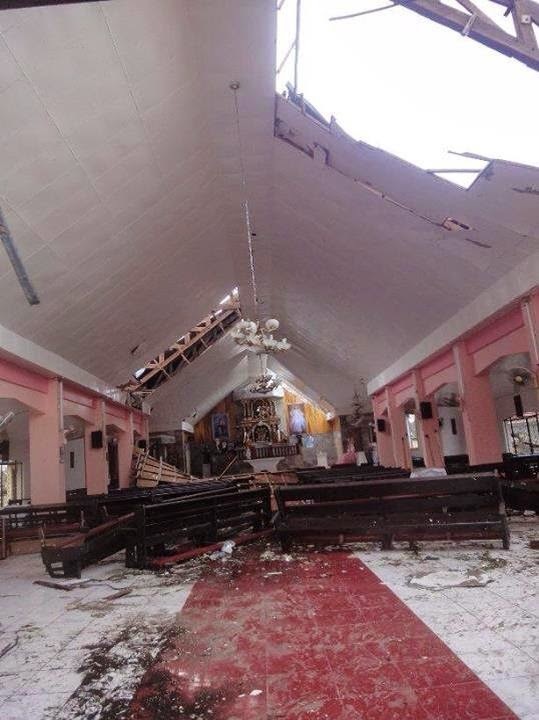 You can view this beautiful church before Yolanda, here. Above, the remnants of Sharon’s father’s home. How do you pick up the pieces of your life from this? 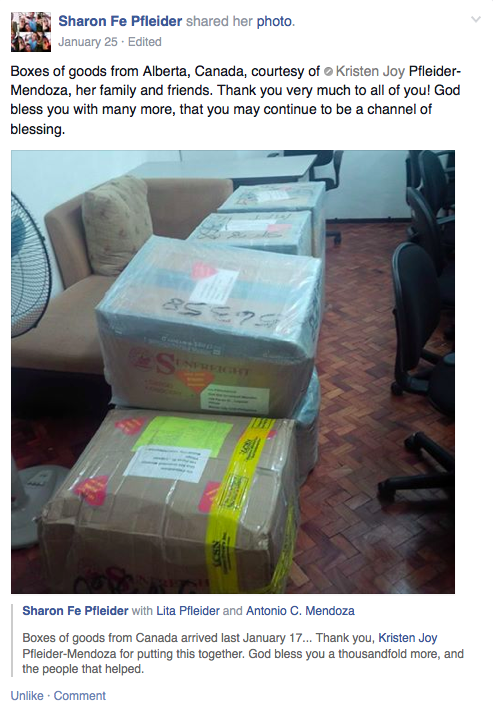 Sharon did not just solicit money for the purpose of forwarding it to an NGO...she instead decided to garner donations to procure and distribute the relief on her own....bypassing the traditional aid organizations and expediting the overall response effort. Innovation at its finest...when people focus on how they can help others. 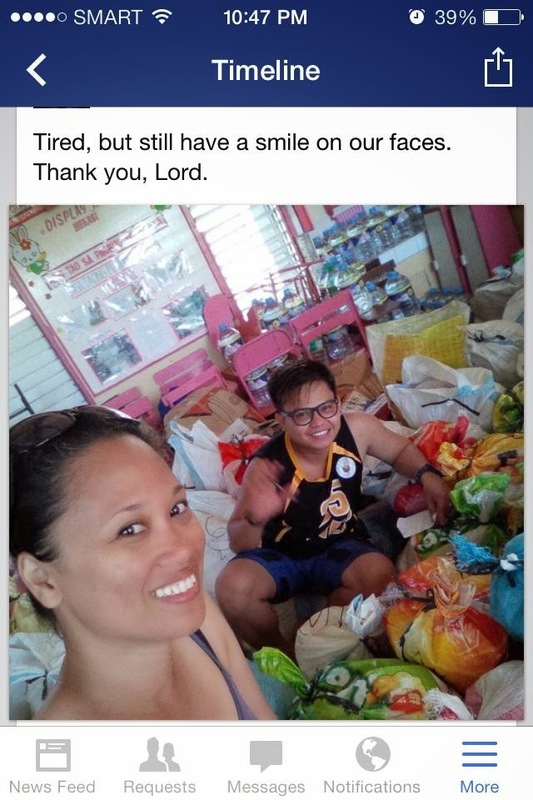 First, Sharon set up a Facebook Page, called Leyte-Leyte Tulong Operation (it is still live...you need to be logged into Facebook to view it) and transparently laid out her plan for relief. Sharon did her best describing what was needed and how she would execute the relief plan. She then crowdsourced donations, leveraging PayPal and other payment services since donations would be pouring in from around the globe. 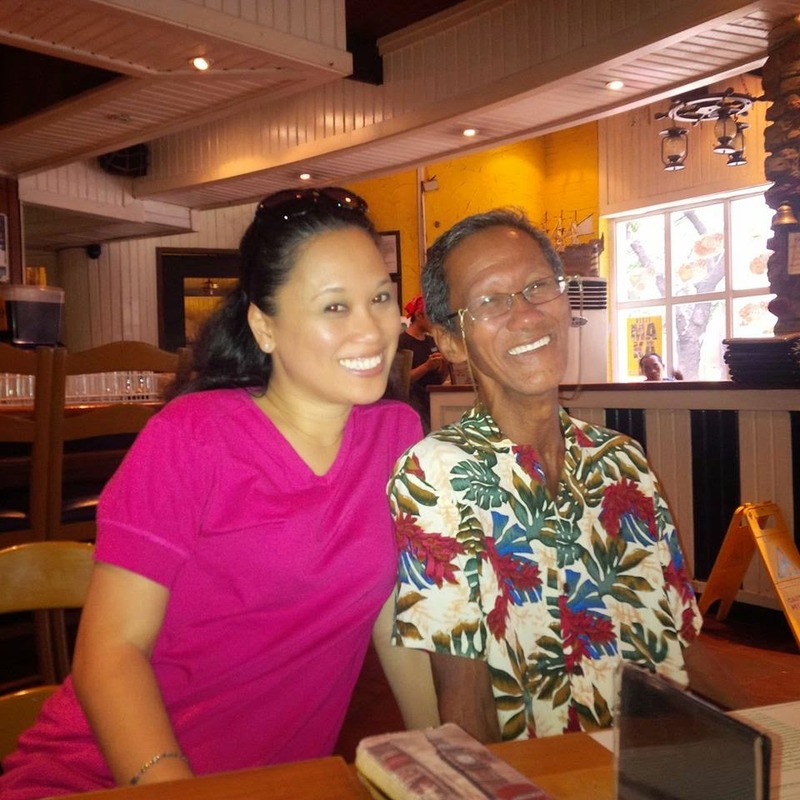 Remember, Sharon is a Filipina with limited resources and no capital of her own...but she is very savvy and passionate. Because Sharon reached out to her own social network...the donors where already familiar with her...so donating was a more personal act than sending money to the Red Cross. Donors knew exactly how, when, and to whom their contributions would be deployed. Each step of the way, Sharon transparently published the donors names and their donations on the Facebook page...along with her warm appreciation on behalf of the victims. Sharon posted events, in my humble opinion, with professional grade photo journalism and candid commentary. Doing so, not only kept everyone informed, but it increased her credibility and trust within the "pop-up" relief community. Needless to say, the supporters for Leyte-Leyte Tulong Operation grew and grew until there was an army. 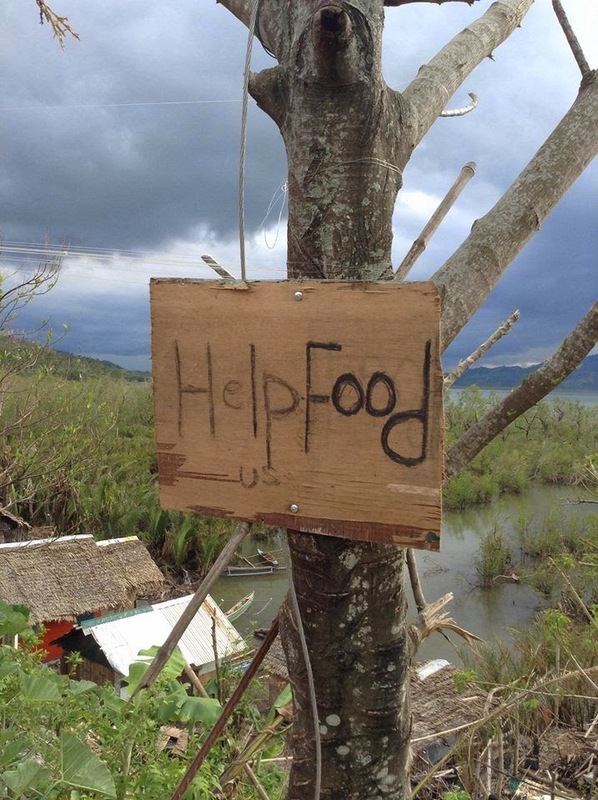 As soon as Sharon had enough donations, she procured the needed food, water and supplies. 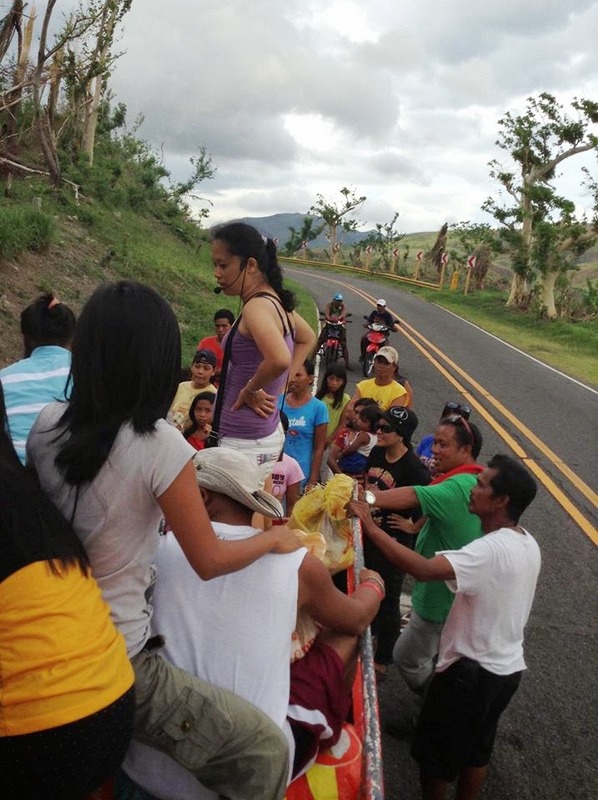 She even documented the staging process of the relief effort as she prepared for the distribution of supplies. 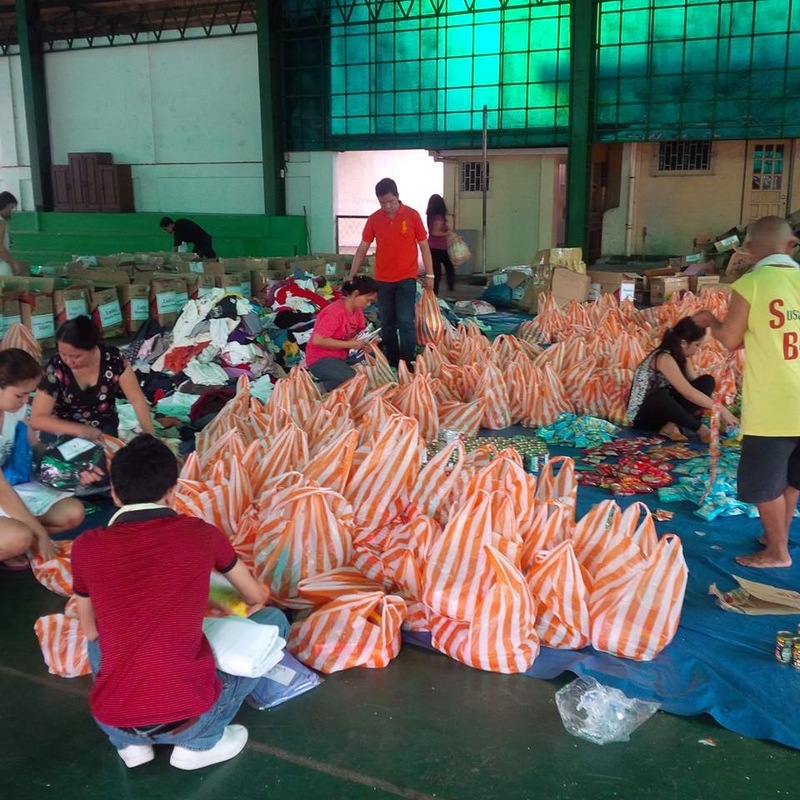 Sharon and others in the community also posted local news and the current progress of the relief efforts. 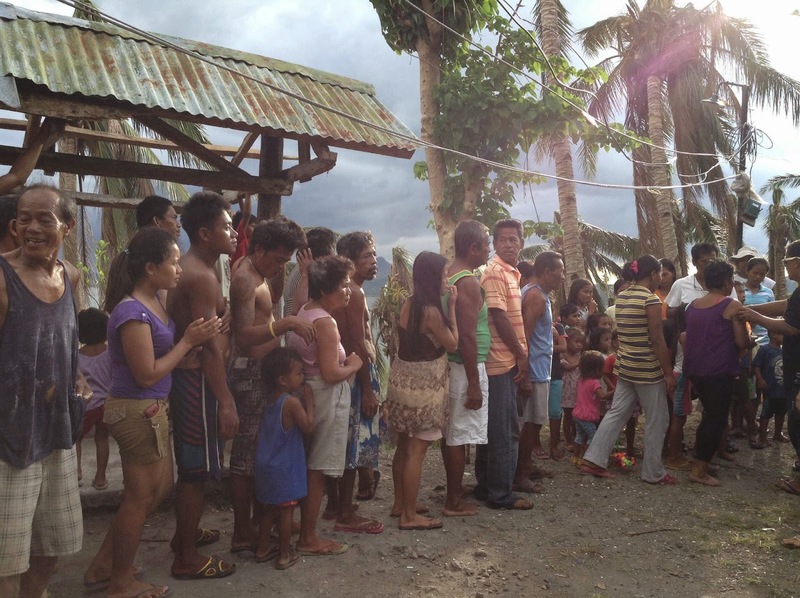 At every phase, the Leyte-Leyte Tulong Operation community could follow the progress and maintain communication with Sharon and others in the community. Then Sharon took the show on the road. 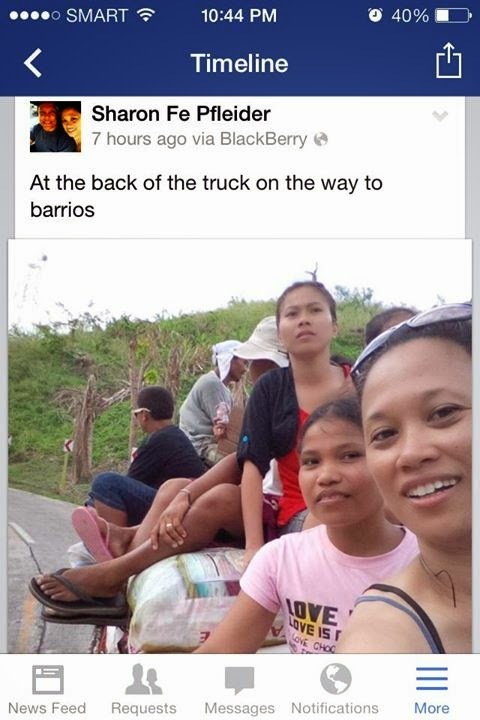 Again, she documented in real time, the relief distribution through photo-journalistic entries on the Facebook page. 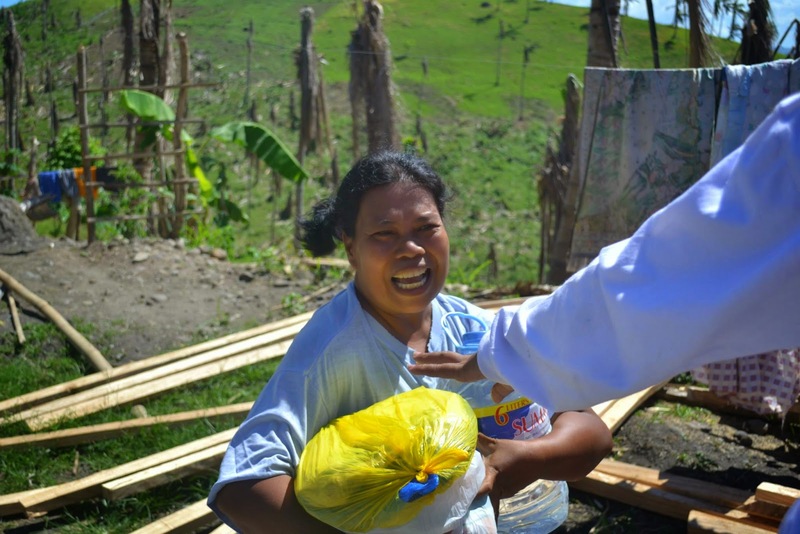 We could all travel with her as she traversed to Leyte and help those in need. Remember, this is a human relief effort. 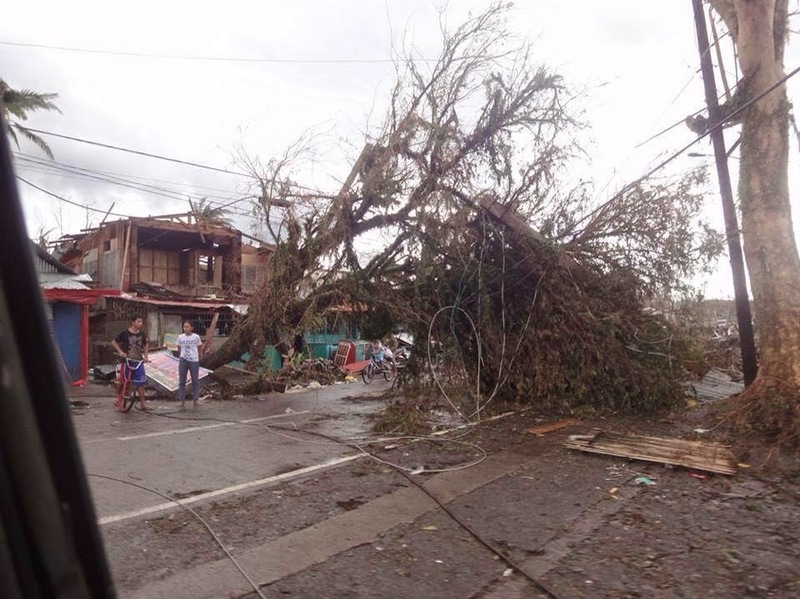 The houses and structures were not what needed help, it was the people and their families that needed comfort. 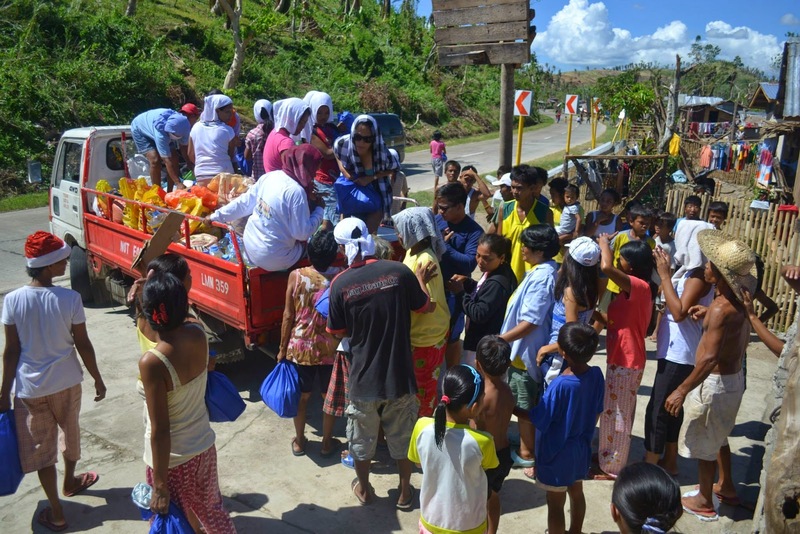 Here, Sharon is passing out food and supplies...she is the one on the back of the truck with the blue bag. We should all learn from Sharon...that no matter who we think we are...how little we think we have...or insignificant we think our position is...we can make a difference. We just have to give ourselves permission and leverage our God given talents and the tools we have at our disposal. I believe empowering passionate and intelligent people to act by giving them the tools to develop compelling solutions is the key to unlocking the creativity and wisdom of the crowd. This is what future innovation efforts will be focused on, whether it is for disaster preparedness or any other human need...the solutions and people who can best solve our problems are in our midst...they are just not evenly distributed...society’s aim should be to connect to and empower them. 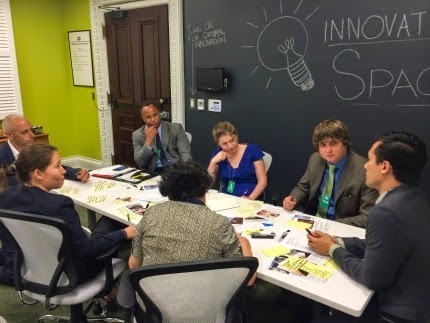 The above photo is a brainstorming session aimed at how and where technology can improve disaster response and recovery. You can download the talking points and fact sheet from the White House workshop recap here. I have always struggled to give my kids the best opportunities in life. Often, I am severely constrained by time, money and location. As a result, I will take big risks to put them in learning situations beyond all of our comfort zones...I can not afford high end private schools. I am sure they will need therapy in their adult life to compensate for some of my risk taking with their learning. But...there has rarely been a dull moment. Especially, for Austin and baseball. In 2007...due to career repositioning...I found myself in Seoul, Korea. I told myself I would only be staying 4 months...but deep inside I saw this as a huge opportunity. Because I am deeply passionate about my family as well as my career, I dragged them all to Seoul...to also take part in the opportunity. 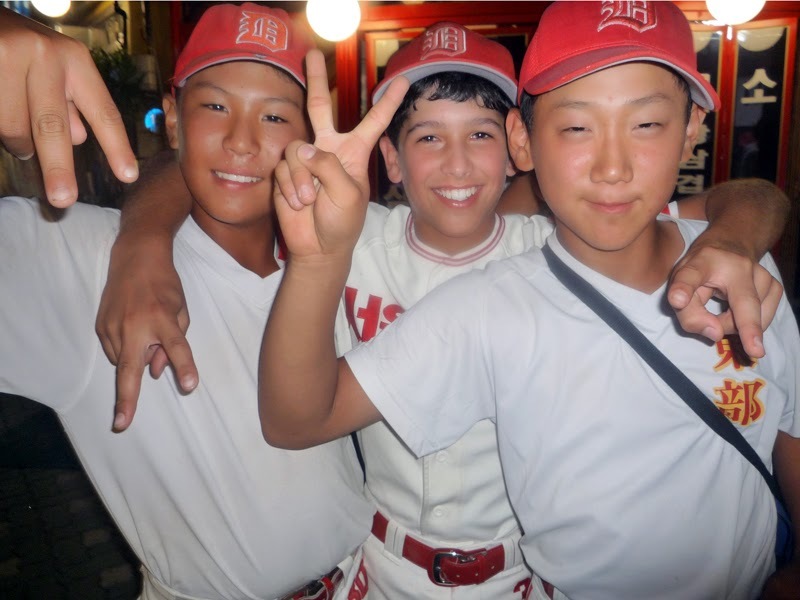 To advance their education, I found art schools for my daughters and a high level baseball team for Adam and Austin...the Dongbu Eagles. It was actually a feeder team that puts boys on track to the Korean professional leagues and beyond. This was not going to be easy...for any of us. 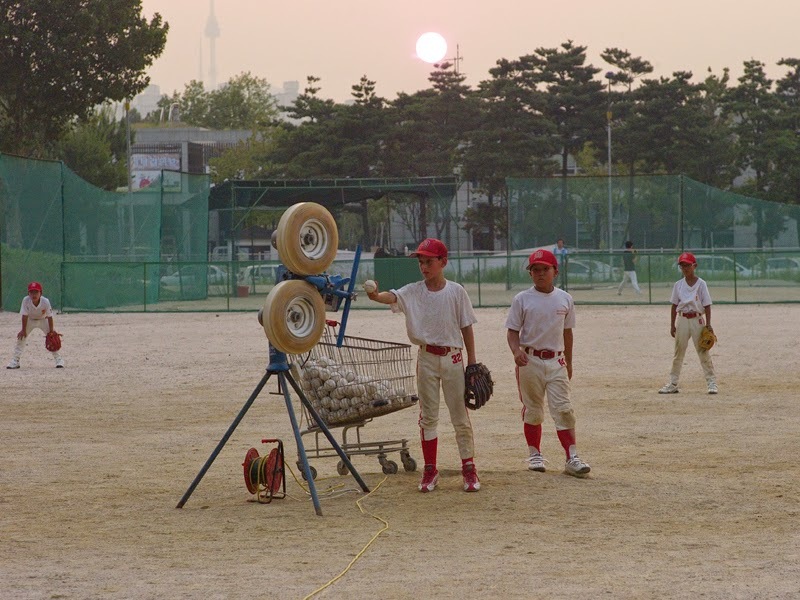 The Dongbu Eagles and their coach were a hard driving baseball club. They practiced 7 days a week from morning until sundown. 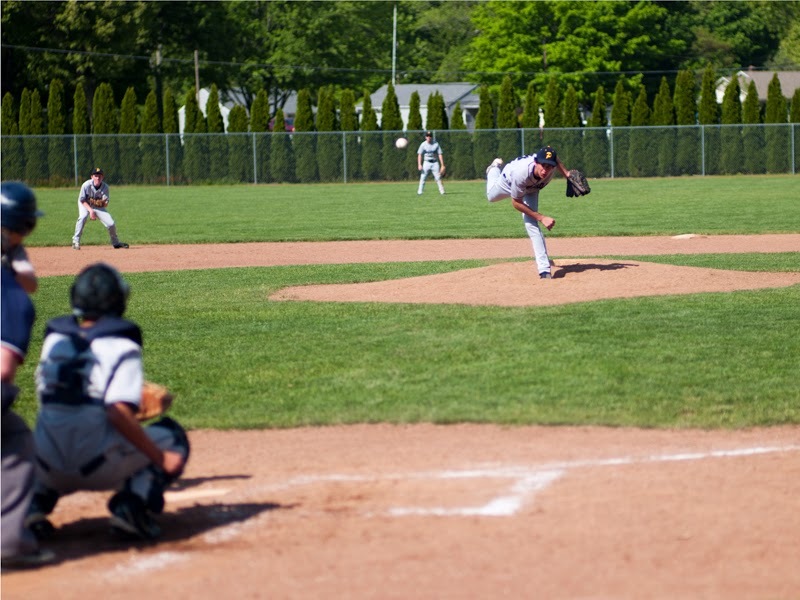 This amount of practice and intensity gave the boys a solid foundation in the fundamentals of baseball...but at great sacrifice. 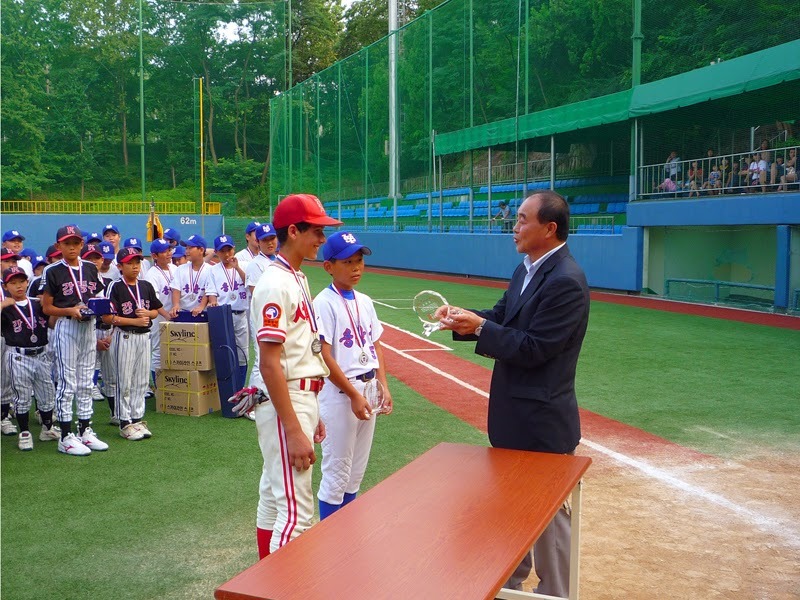 In 2008, the Dongbu Eagles were ranked 4 in the nation (Korea). So, Austin had some serious competition to adjust to...if he was going to play. At first, the coach was quite skeptical and felt that both boys would sit the bench. However, Austin rose to the occasion and won a spot in the starting line up. Awesome! Unfortunately, at least one Korean player was not happy about this. There were grumblings on the team. It was quite difficult for Austin...on many levels. Eventually, Austin won over the hearts and minds of his team mates...as he always does. The pressure was immense for a kid that age. Austin soon found him self attracting attention. 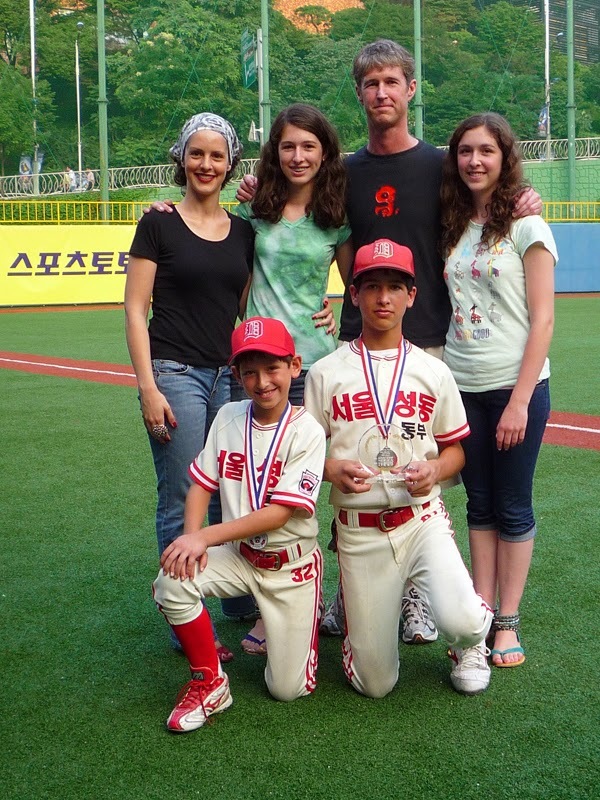 Being one of only 2 Americans (Adam was the other American) in all of Korea to ever play little league baseball, Austin was often in the spot light. This climaxed during an ESPN broadcast of the national championships in 2008. 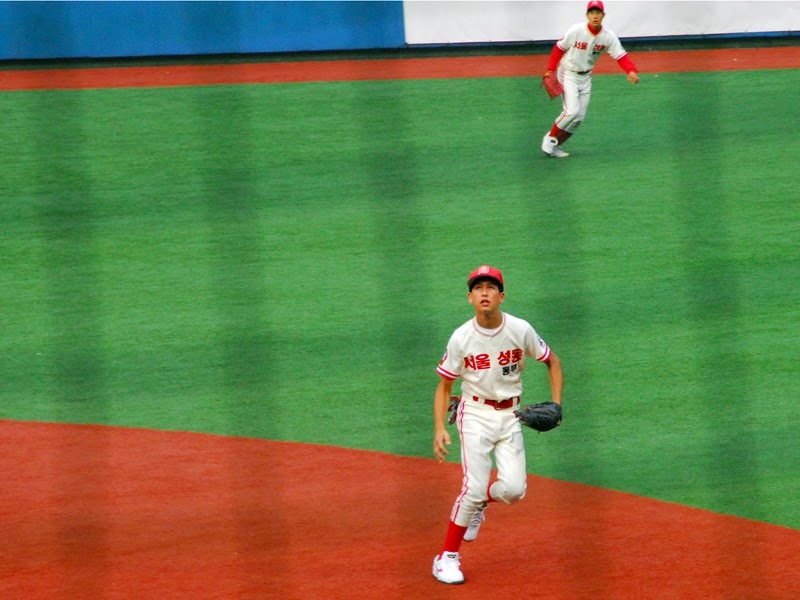 To my relief, Austin composed himself gracefully...even though Dongbu got killed and he struck out. 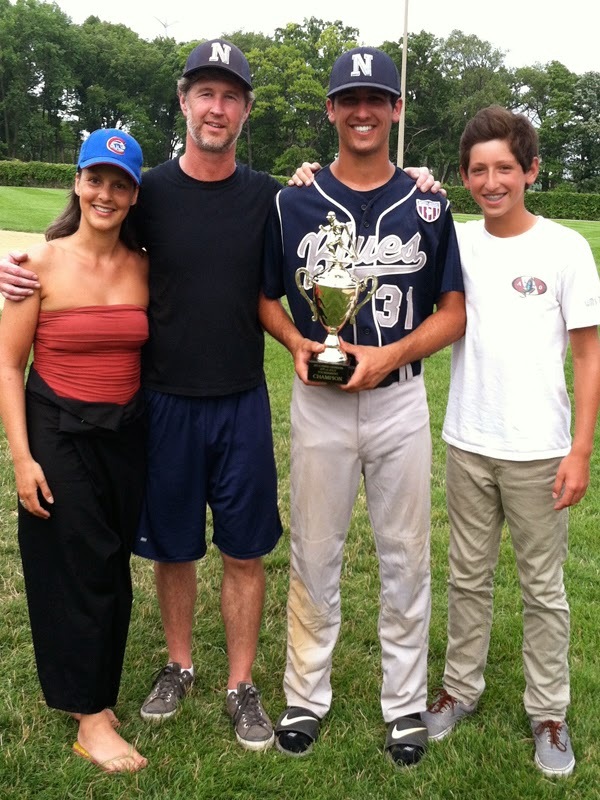 The coach even let him pitch a few innings during the championship game. I would have peed my pants! Overall, I believe Dongbu ended up 4th in the nation that year. 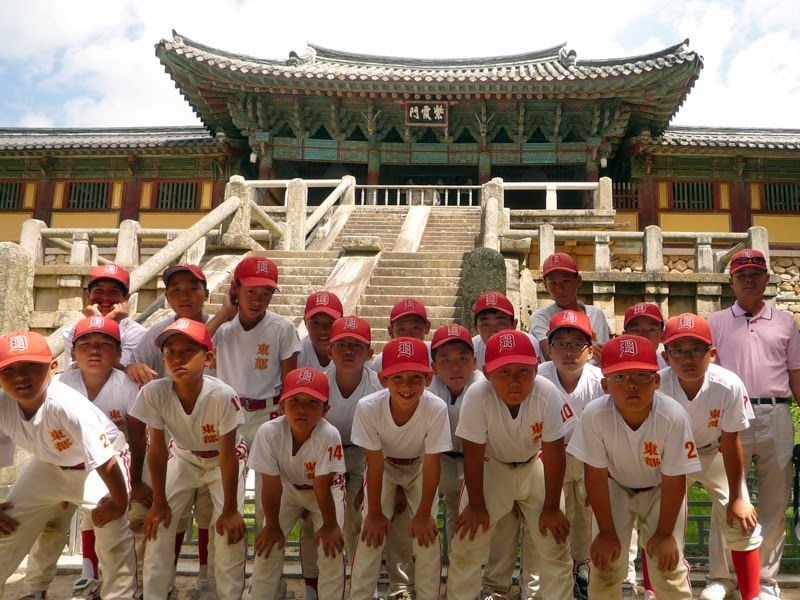 Each year the team traveled to the south of Korea for a tournament in Pohang. Often, we found ourselves in some picturesque settings. In the background of the school yard (above) is the sacred Seoroksan National Park mountain range. In 2009 Austin continued to be a crowd pleaser. That year, Austin is received the most improved player award. We were all proud of him...especially his younger brother Adam who has always looked up to Austin. These were very formative years for both boys. Coach Jung Kyung-ha is a very dedicated man of baseball. He has been coaching Dongbu since 1984 and has been totally focused on the team and the boys ever since. I do not believe he has a family other than the team. He is a baseball monk in my opinion. And I mean that in the best sense. 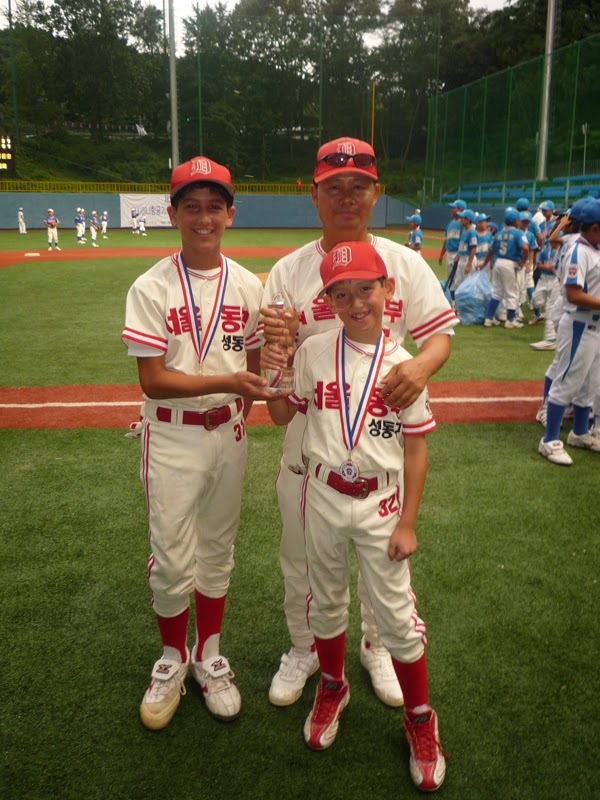 Though I did not know it at the time, he was the only coach in the Korean little league association to extend an offer for Adam and Austin to play. We will always be grateful for this. However, Korea was not the end of Austin’s baseball story. Soon he was back in the US playing for his high school team, the Portage Central Mustangs...honing the skills that he acquired in Korea. 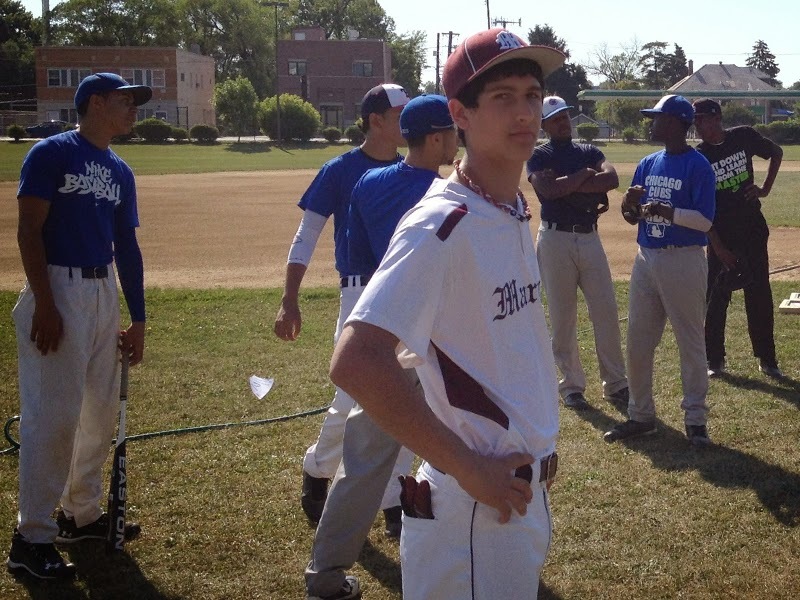 So, in Chicago, I dragged him to Morgan Park High School to try out for the Cubs RBI team program. Once again, Austin was out of his comfort zone..and up against some serious competition...as well as kids from a completely different culture. 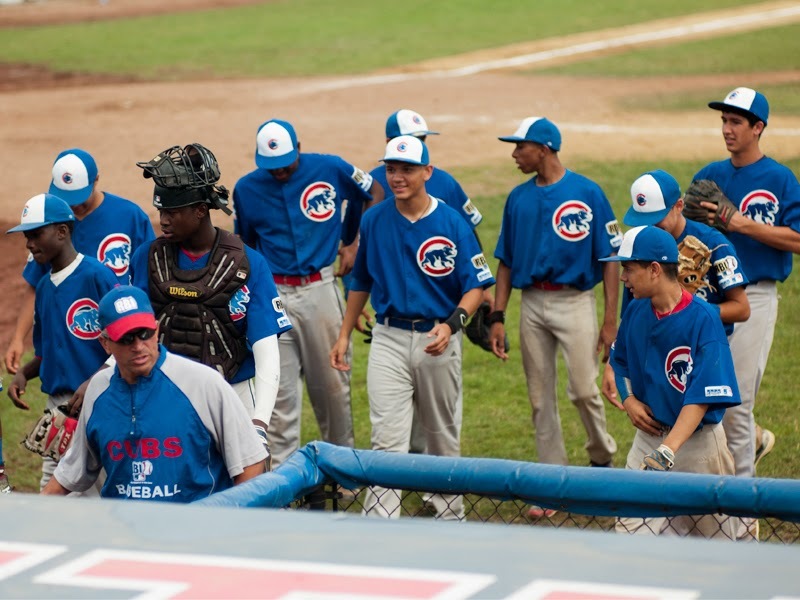 Austin made it through the awkwardness of the tryouts on that hot summer day and made the Cubs RBI 16 year old travel team. 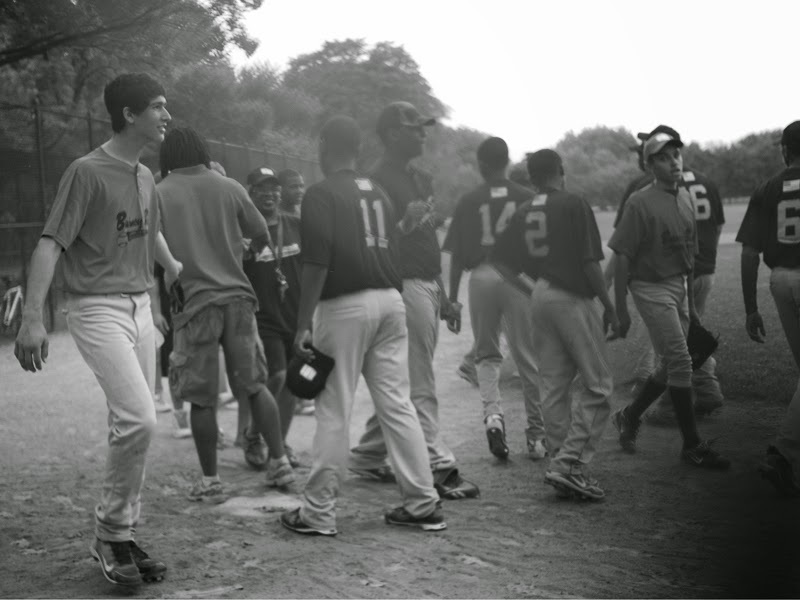 During the week, Austin played in Hyde Park with his RBI training team. 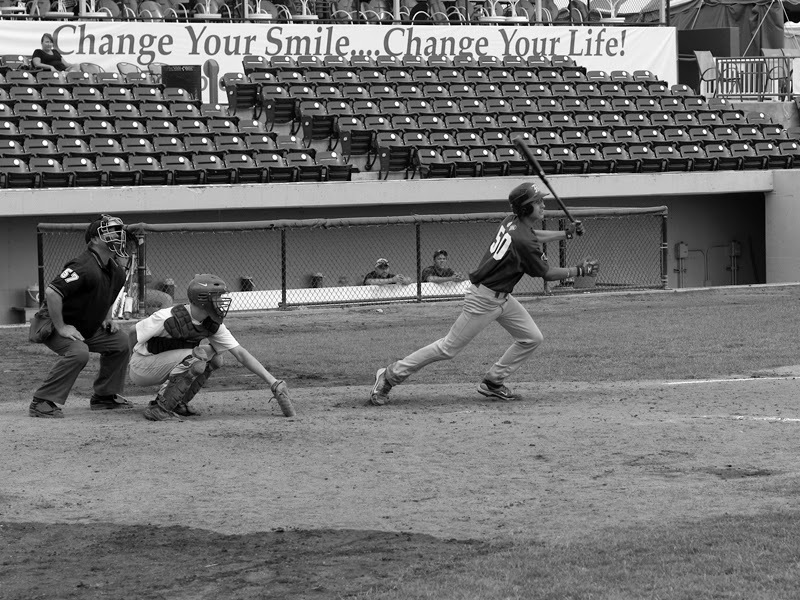 During the weekends, we traveled all over the state of Illinois as Austin played on the Cubs RBI travel team coached. 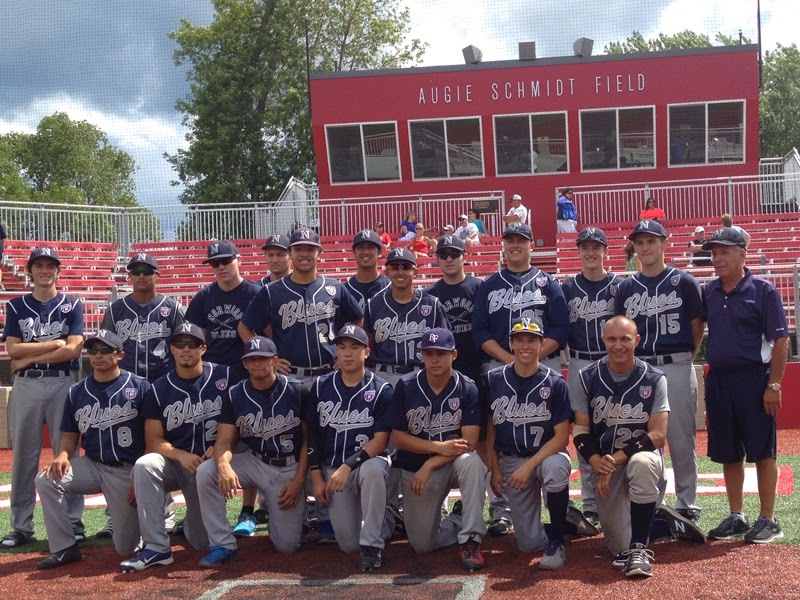 The team was coached by a tough Chicago Police officer, Dave Diaz. He was also the coach for Roberto Clemente High School baseball team at the time...one of the best baseball teams in Chicagoland. Austin was a solid player and a starter for the Cubs RBI, but for some reason did not get to travel down to St. Louis for the championship game. Just as well, we were all traveled out by that weekend. One thing in the US...traveling for baseball is brutal. Expensive and your weekends are owned by the tournaments...same as Korea. 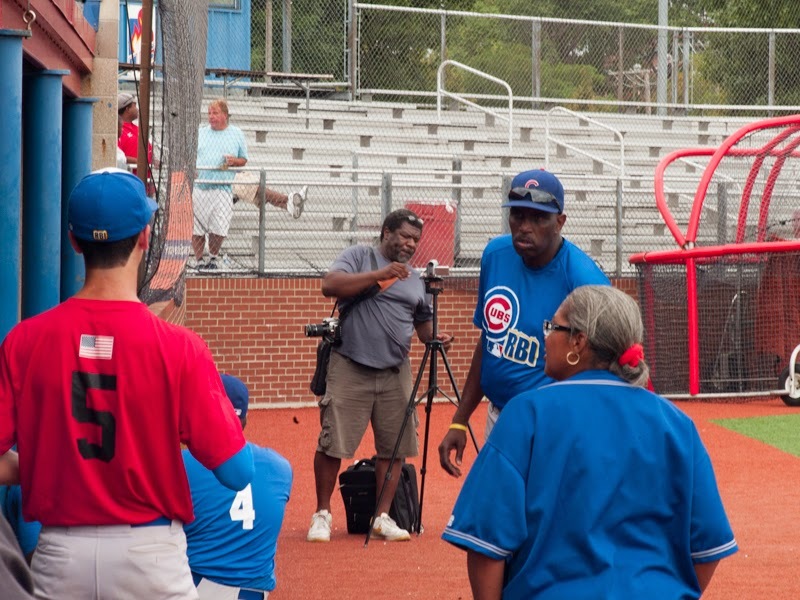 BTW...The Cubs RBI program is headed by Ernest Radcliffe, who happens to the (great?) grandson of one of the greatest baseball players of all time: Double Duty Radcliffe. Coach Radcliffe an ex-ball-player himself is a great motivator and positive force to a lot troubled kids in the south side of Chicago. 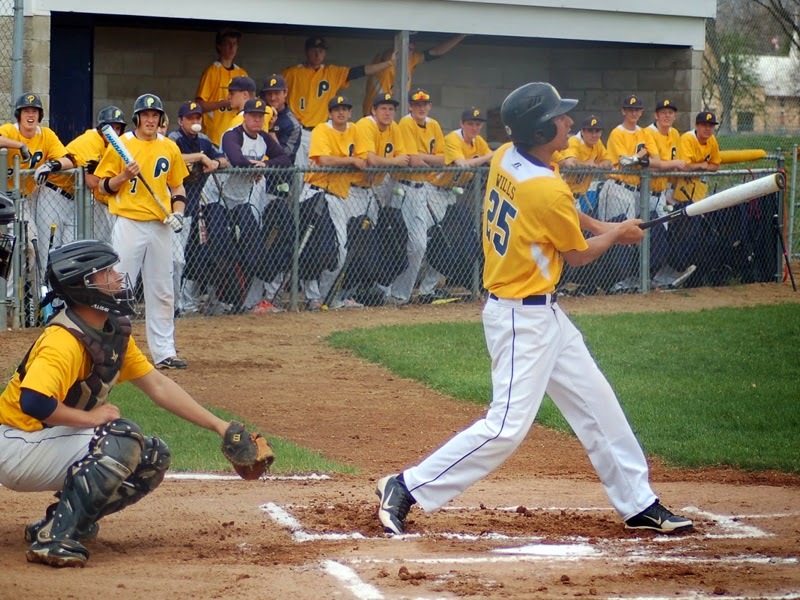 After this experience, Austin was soon he was back in Portage on his high school team, the Mustangs. Austin is now developing physical strength that is enabling his hitting and running game to prosper. His on base average usually lands him a top spot in the line up...on any team. 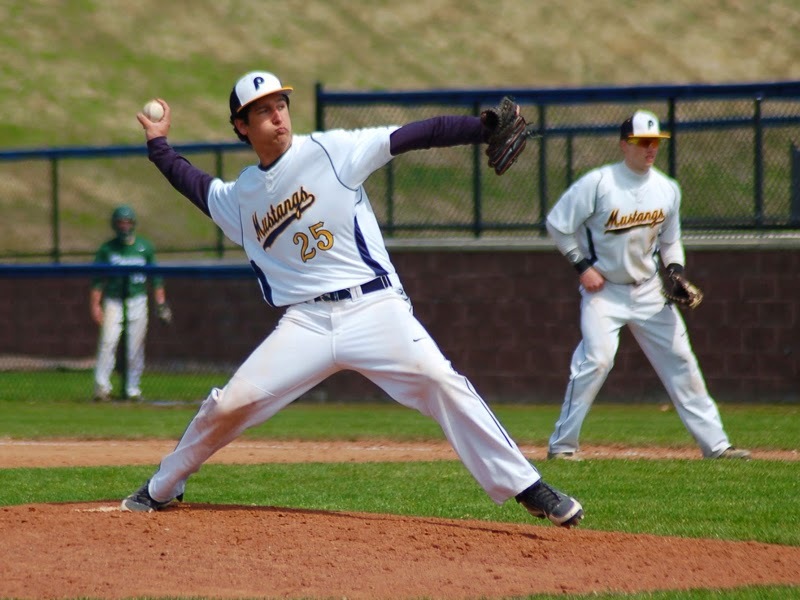 The Mustangs also like him to pitch from time to time, though he feels he will be an outfielder in college. One of Austin’s Portage Central High School coaches got him hooked up with an awesome team in Chicago, the Norwood Blues. They are a high level club that is a stepping stone to the collegiate leagues and above. The Blues are a step up in competition where Austin would find himself playing with kids as old as college freshman...once again...out of his comfort zone. Coached by Richard Pildes of Taft High School in Chicago...who I can confidently say that he is one of the best high school coaches in the US...the Norwood Blues are a class act. And Pildes has one thing in mind...winning. However, he is more of a transformational coach than a transactional coach. 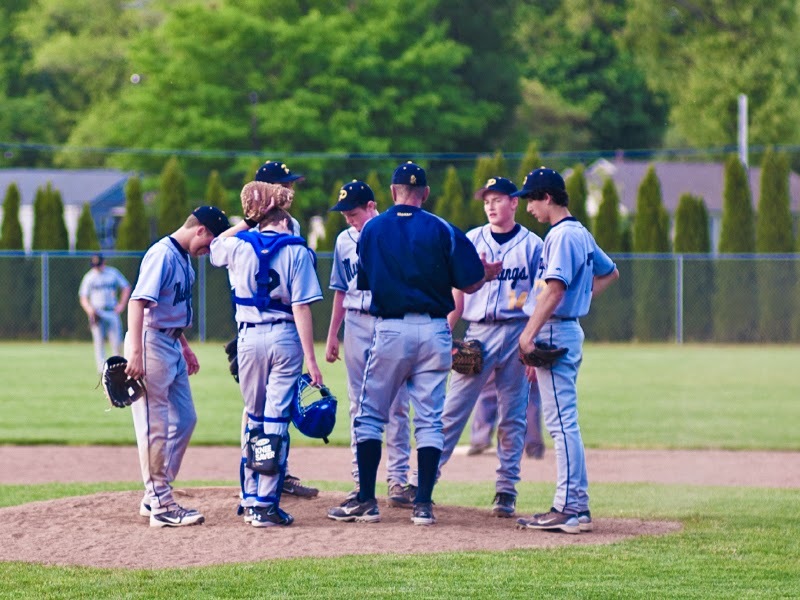 He helps boys find their strengths and ways they can contribute to the team. By understanding your core competencies, you are better able to make a difference to your team when it is needed. 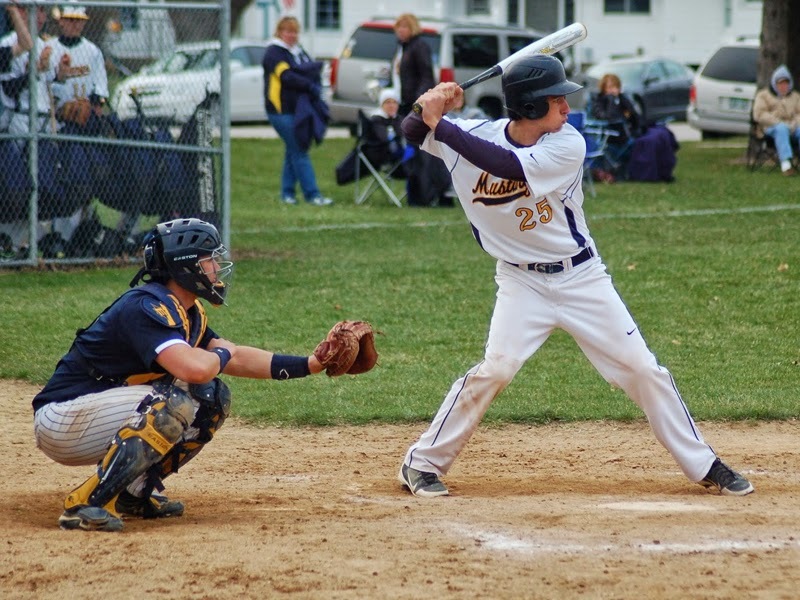 Coach Pildes has recruited a group of talented kids that are serious about the game of baseball. They will undoubtedly benefit from his teachings where ever they end up in life...the MLB or not. While not the most outstanding player...in my humble opinion, Austin is the most outstanding person on the team. All in all...baseball has offered great experiences for Austin on his journey of self discovery...and we are are all proud of his accomplishments. However...Austin’s interests go beyond his baseball endeavors. He spent the latter part of the 2014 summer at the Second City Improve Camp for Teens. Here he seemed to enjoy the stage...his comedy, not surprisingly, is more physical at this phase. And...this fall...Austin won a lead in the Portage Central comedy play, Midusmmer Jersey where he’ll be playing Lyle. 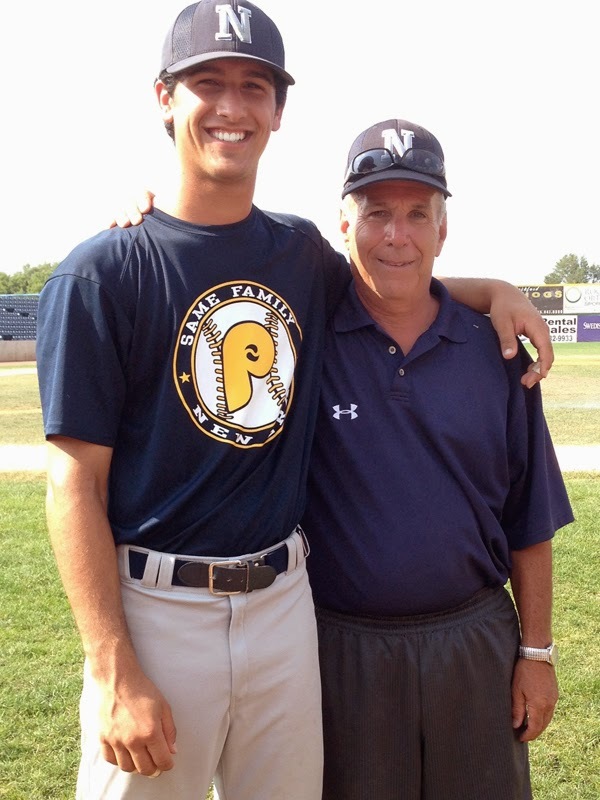 He is still playing baseball on a fall team in Portage...I am sure the Blues miss him...we all do.